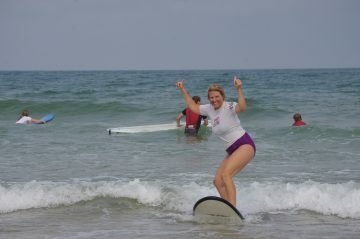 Allows the novice surfer to get a real feeling for surfing in a safe environment and with the correctly adapted material. 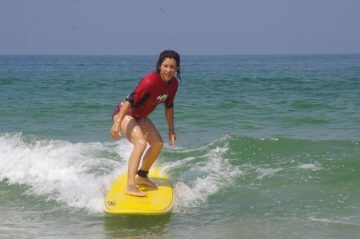 The beginner surf lessons last 2hrs. Maximum 8 surfers per group. 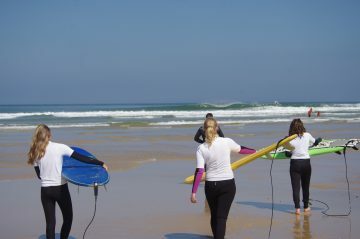 The taster surf lesson encourages you to increase your awareness of the sheer force, inherent in nature. You will appreciate the pure size and power of the ocean first hand. You will also learn how to appropriate these forces whilst discovering your own limitations but essentially you will learn how to enjoy yourselves in the process. As a surfer, you will also learn self control and respect. You will learn how to confront, accept and deal appropriately with challenges, but also, how to deal with frustration. Mix all of these in with a certain natural level of apprehension and we have the perfect mix for a solid rise in performance and self esteem, resulting in an increased confidence in your own capacities. Themes : Discovering and adapting to a new environment. Discovering ones own limits. Self confidence. Learning to listen to ones instincts and gain a certain level of skill in reading and understanding an important element in nature, which in this case, is water. Lesson contents: theoretical and practical. 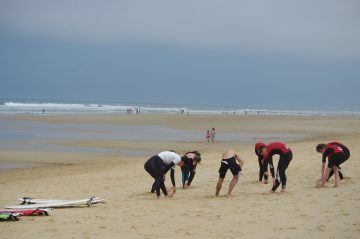 An example of a standard taster surf lesson. You will learn how to carry your board by yourself in a safe and controlled manor. You will also learn the easier tandem board carry, allowing you to walk across the beach with your equipment safely and easily. Introduction to the elements: the waves, the currents, the sand banks and deep water troughs. And most importantly the rules of safety. Warm up and stretch on the beach. 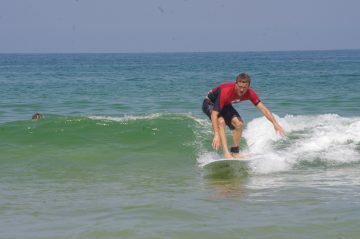 Finding your balance on the surfboard in a lying position: on the beach then in the water. The aim is to catch a white water wave or broken wave whilst lying on the surf board. This will allow you to become accustomed to the handling of the equipment in the ocean, the correct positioning and the general process of catching a wave before taking it any further. When you nose dive, and you will nose dive, you are learning the importance of weight distribution on the board and it’s effects. Now back on the beach we learn how to pop up on the board. This is where the real challenge begins.. 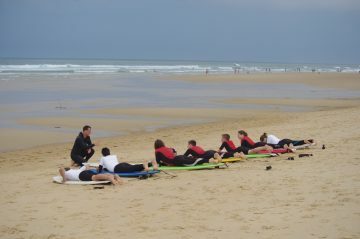 The aim of the lesson is be able to stand on a surf board whilst riding the white water towards the beach. The key to success is to put you feet in the right place on the board in order to keep your balance.